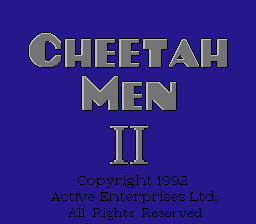 Cheetahmen II was a planned sequel to Cheetahmen from the infamous Action 52 game. In 1997, 1,500 copies were discovered in a warehouse and sold to the public for everyone to… enjoy. 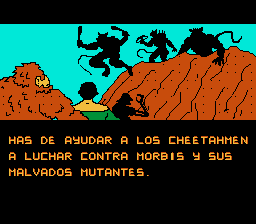 Cheetahmen II manages to be an even worse game than its predecessor with even more glitches. The game isn’t even beatable due to a programming oversight. The music on the other hand, is surprisingly good. 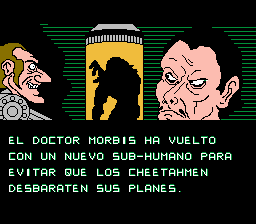 Two good tracks from Action 52 were reused for this game, both of which were composed by Ed Bogas. 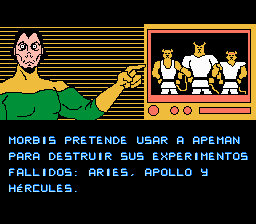 This is what everyone wanted for a long time, a Spanish translation of one of the worst games ever. 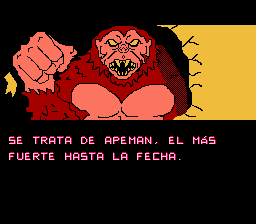 This translation includes all the bugfixes made in a previous release and added some palette modifications to the text to make it more readable.